Late October 2012 was a truly difficult time. We experienced one of the deadliest and most destructive hurricanes New York has ever known. The late-season post-tropical cyclone, widely known as Hurricane Sandy, swept through the Caribbean and up the East Coast of the United States. The devastating storm left dozens dead, thousands homeless and millions without power. Many streets were flooded, and power lines were cut in and around the city. People were fighting the cold out in the streets, trying to help everyone and save as many lives and homes as possible. One of those great fighters was Joseph Piazza. This hero had torn his rotator cuff during the cleanup after the hurricane. Although he was injured, he struggled with his pain trying to save his home and his family. After the rotator cuff tear, Joseph felt like nothing could go worse. As a professional musician, he thought his career as a drummer was over. 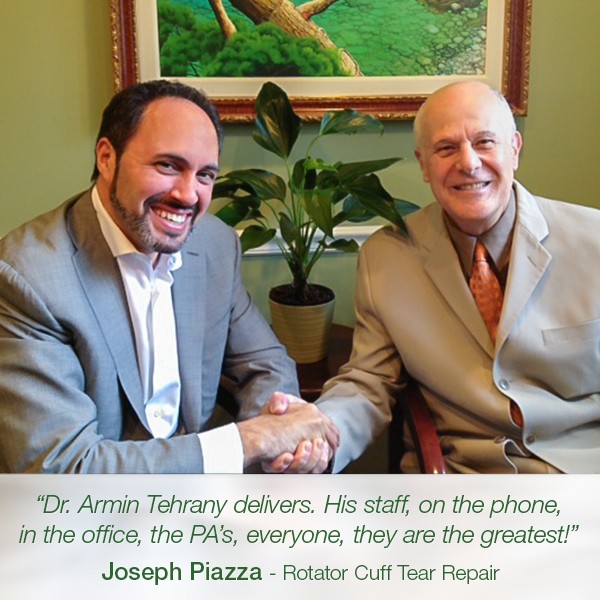 Joe later met Dr. Armin Tehrany, one of the best orthopedic surgeons in New York City. After his appointment with Dr. Tehrany, Joseph was recommended shoulder surgery – arthroscopic rotator tear repair. Dr. Tehrany and his team always go beyond their efforts to help patients get back to their healthy lives. But for Joseph, the motivation was greater than ever. They were helping a Hurricane Sandy survivor who in moments of terrible pain did not stop helping his family and friends. They knew they were helping a hero. Dr. Tehrany insisted on doing surgery for Joseph and all Hurricane Sandy survivors regardless of insurance or costs. A year after the rotator cuff tear repair, Joseph is feeling fit, energized and as he says – he is back on the road, enjoying the music and the drums once again. “In the aftermath of Hurricane Sandy I was doing cleanup and demolition and tore the rotator cuff in my right shoulder. Everyone, from everywhere, was doing everything, anything they could to help in the wake of the great disaster. As an accomplished musician, and drumming being my occupation, I thought, that was it. I was finished. Not yet! I met Dr. Armin Tehrany! He knew what I needed as a musician, and how challenging the recovery would be, and advised me to go forward with the surgery. The most important thing I can say is: He was what it takes and will do what he has to do for you. Dr. Armin Tehrany delivers. His staff, on the phone, in the office, the PA’s, everyone, they are the greatest! Thank you, Joseph, for trusting us and for being such a wonderful and positive person. The world needs more people like you!